It was a bumpy boat ride from Lombok. Sebastien stepped out of the boat, turned around and saw far away the almighty Mount Rinjani, where we were trekking just hours before. 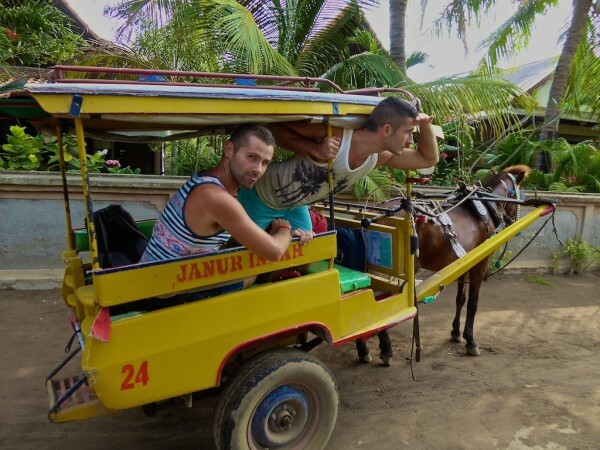 We were on Gili Trawangan, the largest and most touristy island of the famous Gili's group. The main street was busy with the continuous streams of tourists going in and out of shops, bars, restaurants and the annoying horse carriages forcing their way through the mayhem. We were so relieved when we turned into a quiet street, walked for a hundred metres to find Martas Hotel, a quiet, friendly, family owned and run place. This was going to be our love nest for the next 3 days. There are 3 Gili islands, Trawangan, Air and Meno. Trawanagan is the largest and most popular of the 3 and known for its beaches, snorkelling and of course parties. Meno lies to the East of Trawangan, then Air to the East of Meno. Martas is well located at the heart of Gili T near all the best dive shops, restaurants and bars. However, it’s tucked away in a quiet road providing some peaceful respite from all the party noise. Martas is also well located minutes away from the beach, 10 minutes to the best snorkelling reef in the North of the island and 20 minutes walk to Sunset point in the South. We stayed in one of the 9 detached bamboo bungalows, which has 2 floors with its own private front terrace. 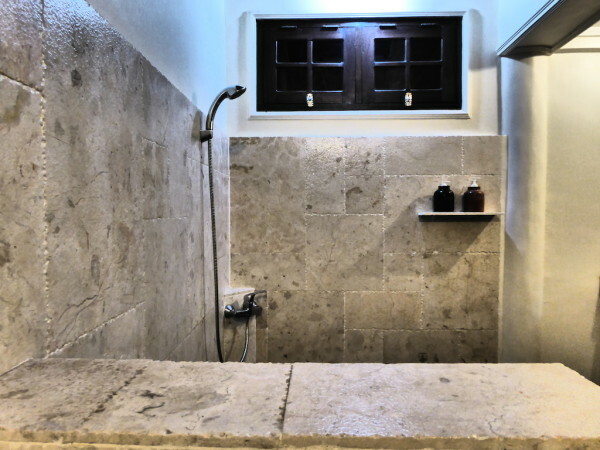 The downstairs area is the large stone bathroom decorated in a minimalist, stylish and modern style. 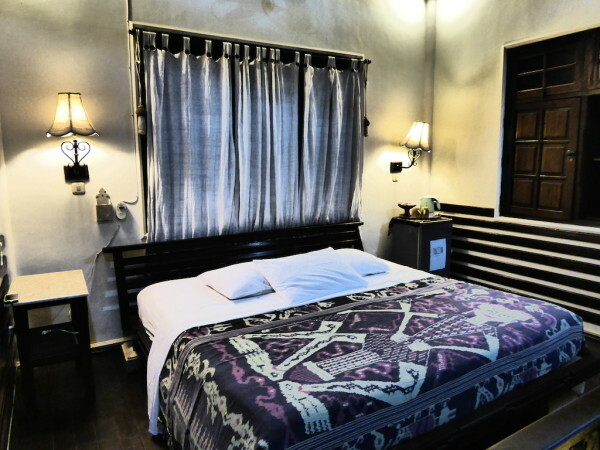 The upstairs is the bedroom area with large and very comfortable bed. There is plenty of wardrobe and storage space and everything decorated in traditional Lombok design with beautiful dark wooden furnishings. The bungalows are hidden in a large, lush tropical garden, circling the communal swimming pool. After an exhausting day of scuba diving around Gili Trawangan, it was such a pleasure to return home to Martas and just relax in this tropical heaven by the pool area with a yummy cup of Lombok coffee to hand. Breakfast was one of the highlights of our stay. It included a variety of freshly squeezed fruit juices, delicious bread, well-cooked omelettes and of course, local Lombok coffee. Oh the Lombok coffee…how we long to return just for this. If you're also a slave to caffeine you will appreciate it a lot. Joanna and Martas are the husband and wife team behind Martas Hotel, which has been going strong for nearly 15 years. They are extremely friendly and passionate about the island and between them have a plethora of knowledge and advice about what to do, best places to eat and what the latest happenings are. Martas and Joanna’s staff were all equally as friendly and chatty to us. They have hosted many gay couples in the past and welcomed us with open arms. We really felt like we were at home here and definitely recommend it as a place to stay for gay couples. The bungalows at Martas start from 830,000 Indonesian Rupiahs (£40 / $60). To book one of the 9 bungalows at Martas, check out them out on Booking.com.